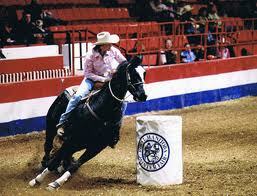 Barrel racing is a rodeo event in which a horse and rider attempt to complete a clover-leaf pattern around preset barrels in the fastest time. 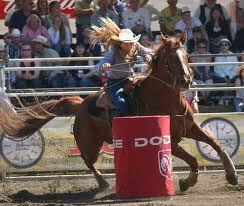 Though both boys and girls compete at the youth level and men compete in some amateur venues, in collegiate and professional ranks, it is primarily a rodeo event for women. It combines the horse's athletic ability and the horsemanship skills of a rider in order to safely and successfully maneuver a horse through a clover leaf pattern around three barrels (typically three fifty-five gallon metal or plastic drums) placed in a triangle in the center of an arena. The timer begins when horse and rider cross the start line, and ends when the barrel pattern has been successfully executed and horse and rider cross the finish line. The rider's time depends on several factors, most commonly the horse's physical and mental condition, the rider's horsemanship abilities, and the type of ground or footing (the quality, depth, content, etc. of the sand or dirt in the arena).